Just received information on the new Norwegian Coast Guard cutters that will be replacing the three ships of the Nordkapp class in the form of a 26 page pdf that appears to have been briefing graphics from August 2014. We discussed these ships briefly in an Oct. 5, 2016 post. June 25, 2018 Marine Log reported that VARD had won a contract to build three ships at a cost exceeding NOK 5 billion (about $618 million). According to the presentation they are going to be relatively big ships, about three times the size of the ships they will replace at 9,800 tons, and 136.4 meters (447.4 ft) loa, 19 meter (62.3 ft) beam, and 6.2 meter (20.3 ft) draft. Later information puts the beam at 22 meters (72.16 ft). That makes them larger than the icebreaker Glacier, although they are not icebreakers, only ice strengthened. It does not have an icebreaker bow. They are expected to hangar two NH90 helicopters (10,600 kg/23,370 lb max TO weight) with deck space to land an AW101 (14,600 kg/32,188 lb max TO weight). They are expected to have a speed of 22 knots, endurance of eight weeks, accommodations for 100, collective CBRN protection, and space for containers on deck. They will have a single medium caliber gun, apparently a 57mm, with an all weather fire control system, plus machine guns, sonar, and torpedo and mine storage for the helicopters. Since these ships will be armed very much like the Nordkapp class that they replace, there will all probably be provision for mounting Naval Strike Missile, although that is not mentioned in the briefing. They will also be equipped with pollution abatement systems. These ships were designed by VARD, also the designer of the US Coast Guard’s Offshore Patrol Cutter and Canada’s Arctic and Offshore Patrol Vessel. This might be a design we should consider as an Arctic Patrol Cutter. Certainly the Norwegian Coast Guard should be able to provide some good advice once they have had some experience with these. This entry was posted in Arctic, Atlantic, Europe by Chuck Hill. Bookmark the permalink. SAAB is providing their communications systems. One thing I notice here is that these ships have their hull number preceded by a W, just as US cutters used to. 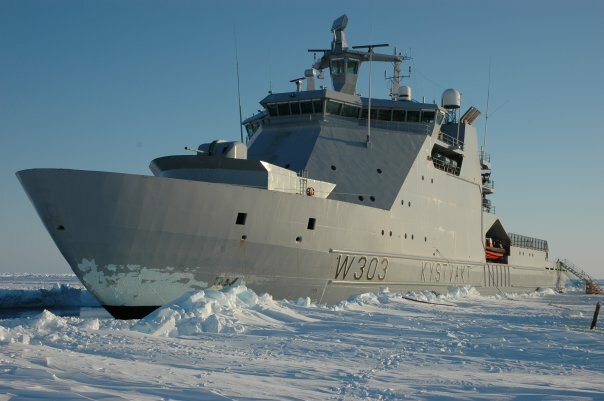 VARD (a Fincantieri company) is the leader in ice-classed or ice-capable ship design.